Todaiji ("Great Eastern Pagoda") is one of Japan's most famous and historically significant pagodas and a landmark of Nara. Todaiji was constructed in 752 as the head pagoda of all provincial Buddhist temples of Japan and grew so powerful that the capital was moved from Nara to Nagaoka in 784 in order to lower its influence on government affairs. 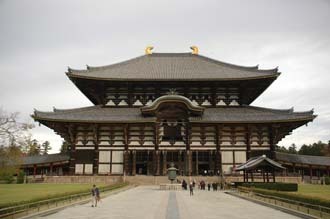 Not only is Todaiji housing Japan's largest Buddha statue (Daibutsu), but it is also the world's largest wooden building, even though the present reconstruction of 1692 is only two thirds of the original temple's size.